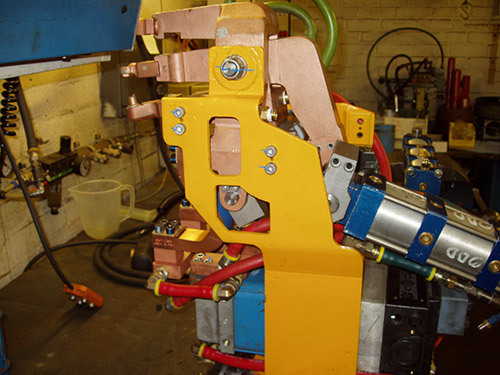 AWD offers a complete program which rebuilds weld guns and arms. AWD is able to provide a cost effective and efficient service which increases the bottom line profits of our customers. First, worn and dirty guns and arms are cleaned and assessed by a skilled technician. The customer is provided with a detailed quotation for the repair. Experience tells us that 80% of the time repairs can be made at substantial savings. The customer is informed if the article is beyond economic repair. During the repair process all parts showing wear or damage are repaired or replaced. Often threads, tapers, eroded contact pads, leaks, bushings, and fittings, etc. need to be repaired. After repair, each arm or gun is extensively checked for mechanical and electrical accuracy and functionality. Water flow and leak tests are performed and documented. The average gun and arm can be rebuilt up to three times – and each time is generally less than half the cost of the new equivalent. Contact AWD to see how we can save you money.